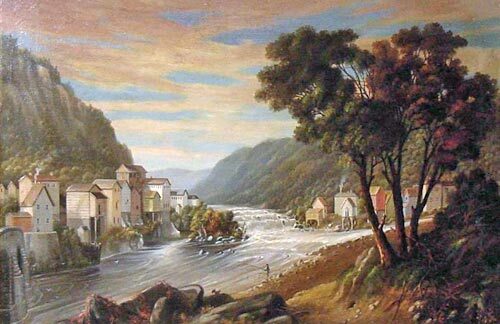 Little Falls on the Mohawk River, New York, 14" x 23"
After studying under H.D. Martin and G. Boughton, Ferguson focused his talents toward romantic landscape painting. He found inspiration during his extensive travels in Mexico, South America, Egypt, Europe and the Mediterranean. Closer to home, he captured the vistas of the Hudson River, Berkshire Mountains of Massachusetts and White Mountains of New Hampshire. A member of the National Academy and Century Association, Ferguson exhibited extensively. His work was shown at the Brooklyn Art Association, Century Association, Boston Art Club, Art Institute of Chicago, National Academy of Design and Pennsylvania Academy of Fine Art. In his later years, he became a respected art restorer providing his services to galleries and collectors. Ferguson is listed in Who Was Who in American Art by Falk.